Thanks to Mr. Lee for including the DSA’s need for volunteers and the link to our website in this week’s High School Report! Junior Ian Chinnery has been selected as Junior Cadet Officer of the Year for Delaware Wing by the Civil Air Patrol. The CAP is the official auxiliary of the United States Air Force whose three main missions are aerospace education, emergency services, and cadet programs. Chinnery is Alpha Flight Commander of his squadron. Congratulations! Athletes from various sports teams traveled to Pulaski Elementary School to read and interact with first graders on Friday, Oct. 17. Chaperoning the event were librarian Debbie Supplee, football coach Donavon Alderman, and lacrosse coach Brett Townsend. Student-athletes who participated were: Jessica Alfaro, Isaiah Archie, Brandon Austin, Jermain Banner, Andrea Becerra, Jerome Blakeney, Maya Brooks, Deon Chin, Evelyn Clement, Angel Contee, Gudelia Cruz-Ortiz, Maria Cruz-Ortiz, Monica Cruz-Ortiz, Lizbeth Cruzatta-Ayala, Shalir Flemming, Wanya Gibson, Sarah Gotthold, Christine Holness, Brian Jones, Emily Jones, Edward Major, Brianna Martinez, Sharif McCormick, Eliana McCray, Sara Mittnight, Malich Murray-Wallace, Maddie O’Neill, Dominique Pizzo, Collin Porter, Cameran Pottinger, Gavin Reeder, Tyairra Rider, Alexis Romeo, Michael Ross, Nymera Sessoms, Joslyn Sims, Shakeela Slade, Bailey Smith, Paige Smith, Emily Stultz, Samantha Summerlin, Kyle Thomas, Karrelin Torres, Elijah Townsend, Luis Vazquez, Daniel White, and Ronizah Winfield. 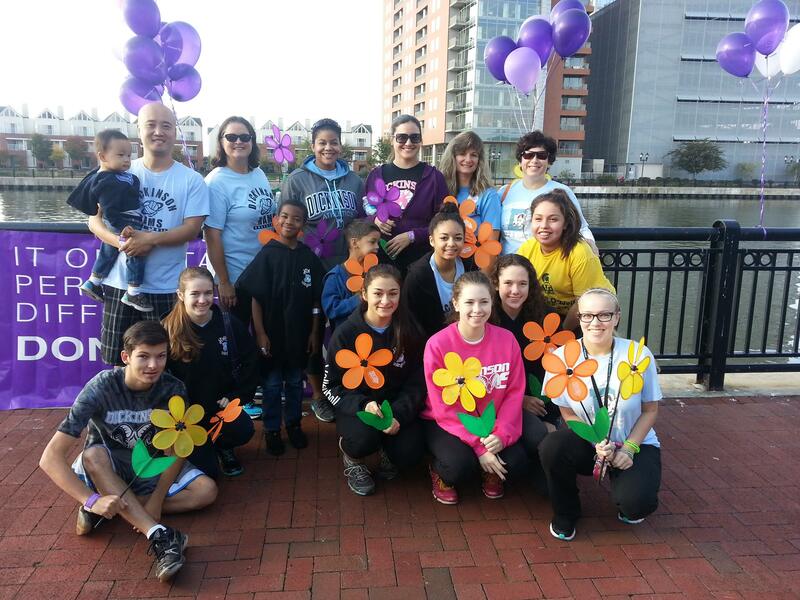 Members of the volleyball program participated in the 2014 Walk to End Alzheimer’s along the Wilmington riverfront on Saturday, Oct. 18. Combined with money raised from last spring’s boys’ volleyball alumni match and this year’s donations, the Dickinson Volleyball Rams raised almost $1,000 for the Alzheimer’s Association. Participants for the walk included coaches David Lee, Shana Hairston, and Jane Zippe-Putscher; as well as players Xandria Deleon, Sarah Gotthold, Emily Jones, Emily Ragan, Rebecca Richardson, Joelle Wilkins, manager Joey St. Pierre, and a number of parents. Students in Kristin Zerbe’s English class had their poems published in the east coach poetry anthology A Celebration of Poets. The periodical issued by Creative Communication includes works from Brandon Garrison, Harshil Patel, Dominique Pizzo, Cameran Pottinger, and Dawnysha Wilson. A representative from American Beauty Academy visited on October 30 to speak with prospective students. Centenerary College will be visiting on Friday, November 7 at 9:15am. See your guidance counselor if you’re interested in attending. Friday, October 31 is an inservice day. There is no school is session for students. There is no school this Tuesday as well for Election Day. The school will be sponsoring a canned and non-perishable food drive until Friday, October 24. Donations will be accepted in the auditorium lobby each morning, and those who donate will earn their class ‘spirit’ points towards Spirit Week competitions and a chance to win free homecoming tickets. Junior Makaya Goicuria was selected by English teacher Kristen Zerbe as Writer of the Month of September in Zerbe’s Creative Writing class. A representative from Capitol College visited on Thursday, October 16 to speak to prospective students. A representative from Lincoln University will visit this Tuesday at 9 a.m. Interested students should see their guidance counselor for more information. After school activity buses will begin to run every A-day at 4:15 p.m. Previously, activity buses were only provided on B-days. Spirit Week begins today. Check posters around the building for each day’s theme. The homecoming game will take place on Friday, October 24 at 7 p.m. against Howard and the homecoming dance will be held on Saturday, October 25 in the gymnasium. Representatives from the Department of Education were at the school Sept. 24 to help graduating seniors in the college application process. The administration presented its proposal to create a Middle Years International Baccalaureate program to the school board during the September district board meeting. The school board is expected to vote in October on whether to approve the proposal, which will expand the school to grade six through 12 and offer IB classes to middle school students.